Altitude hold mode on a drone allows the aircraft to maintain a roughly consistent altitude. This feature is achieved most commonly via use of an ultrasonic sensor. This feature makes take off and landing much easier, by automating the action. Drones with a headless mode are generally easily to fly. Headless mode stops a drone’s ability to rotate left and right. So essentially, if placed in a forward facing direction at take-off, the front of the drone will always stay front facing and land in a front facing position. 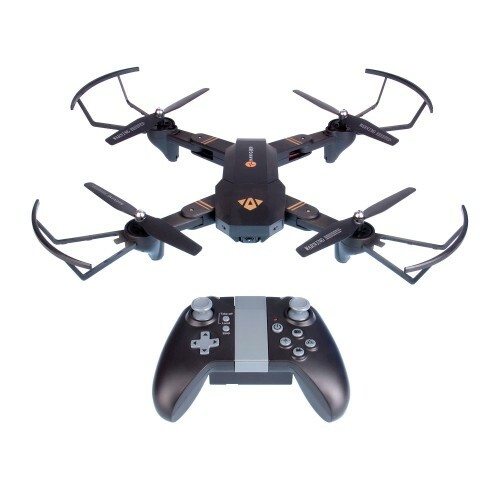 If the headless mode is disengaged, the drone will be able to rotate left and right and by introducing this extra axis to control, will therefore tend make flying a bit more challenging. FPV stands for First Person View. While recording video during flight, you can get the feel that you are actually on the drone and experiencing the flight yourself, through the eyes of the drone. Take off and landings are the trickiest part of flying. With a one-button take- off, this automates the process and makes take-offs and landings much easier and helps to avoid damage from accidental crashes. Flips are rolls are mid-air stunts. A flip is a forward facing 360 degree rotation and a roll is a sideways 360 degree rotation. When your drone is about 5 meters above the ground, simple press on of the stunts buttons to enact each stunt. This feature controls how fast the drone reacts to the controls, or in other words how nimble it will behave. Slow speed will see the Drone slowly react to controls and will therefore be much easier to fly. This is especially good while learning to fly. The fast speed setting however will see the drone react very quickly to controls and is something more advanced users will enjoy. Recording and or watching drone footage through VR goggles adds a new level of reality to drone videos. There are various goggles available however Goggle cardboard would have to be one of the more common. Where required, the video capture of your drone can be inversed or flipped, essentially making the sky on the bottom and the ground at the top of recorded images. With all the bangs and bumps a drone takes, sometimes it needs a little tune up to keep it in the best running condition. If your drone is off centre and is slowly drifting to one side when it is supposed to be stationery for example, you may need to calibrate the internal gyroscope. To do this, simply place the drone on a flat level surface. Turn the drone ON then press the gyroscope calibration button. This will reset and equalise all the sensors (so to speak), to give your drone the best chance at optimal flying control again. Click the image to view the CASA guidelines on UAV! Loaded with all the regular features such as 6 axis gyro, one-touch 360 tricks, 2.4GHz remote and headless mode; for those just starting out, the WF40 also has extra WiFi and flight path smarts that allow your WF 40 to "trace-and-fly" a path, all quickly and simply programed via your smartphone. With one-touch takeoff and landings and voice commands, leave some of the hard stuff for your Drone to manage, why you sit back and enjoy your flight using your "First Person View" (FPV) footage being streamed directly to your portable smart device. “REPACK" is a broad term LASER uses for special-buy items which are only available direct from the LASER web site. These items have been heavily discounted to clear - well under the Recommended Retail Price. These items may have been returned from retailers as faulty, but upon later testing no fault was found; or the unit was repaired to as new condition by the factory. Such stock may have slight soiling and/or minor blemishes on the actual product even though the utmost care was taken during processing. These products come with full 90 day LASER warranty from the date of invoice and complete accessories.